PARIS – France will soon implement a tax on financial transactions, and will not wait to see if similar measures will be instated by other countries across the European Union. In a radio interview given on January 8th, Benoist Apparu, a Secretary of State of France, confirmed that a new bill will soon be presented to French parliament, introducing a financial transaction tax into the national tax system. Benoist Apparu indicated that a bill with new tax may be tabled in parliament by the end of February, and a detailed proposal for the implementation of the tax may be completed by the government as soon as the end of this month, despite the fact that the government is yet to decided what transaction the new levy will apply to, and the mechanism for the tax has not yet been clarified. 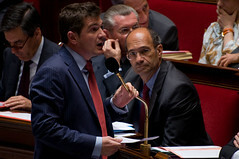 The Minister’s comments come only days after President Nicolas Sarkozy stated that France will instate a financial transaction tax by the end 2012, regardless of whether any other countries follow suit. According to Benoist Apparu, the President will discuss the tax with Chancellor of Germany Angela Merkel on January 9th, and try to persuade her to instate similar measures in Germany. However, analysts have suggested that Germany, which has been a long time supporter of the new tax, is unlikely to adopt a financial transaction tax at this stage, unless similar tax measures are instated by all nations in the European Union. The Prime Minister of the UK David Cameron was quick to comment on plans for the tax, saying that France is free to instate the measure nationally, but he would veto any proposal to implement the tax across the EU. The Prime Minister said that he would not support the tax at all, unless it was implemented globally.